Self-healing thermal barrier coatings (TBCs) designed to improve gas turbine engine efficiency have been developed by researchers at TU Delft in the Netherlands. The TBCs were tested in aero-engines, but can potentially be used in ships, submarines and even for generating electrical power. Researchers working on the self-healing thermal barrier coatings (SAMBA) project wanted to develop a system of applying new ceramic TBCs to the most critical parts of engines. This would enable operators to push the engines beyond the melting point of the structural components. By allowing higher operational temperatures, the ceramic coatings can save companies fuel and reduce CO2 emissions. 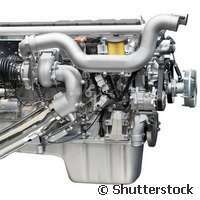 The operation of engines relies on the reliability of critical components, which are covered with a TBC. Failure of the TBC can result in accelerated degradation of the critical component, such as a blade, and ultimately lead to operational shut down. The ceramic TBCs' ability to repair small cracks therefore has the potential to prolong the lifetime of coatings by 20 - 25%, and thus significantly reduce maintenance costs. It will also lead to a reduction in the number of replacements during a gas turbine engine lifetime. Throughout the project, industry and universities worked together to develop and improve the TBCs. The new ceramic coating consists of a layer of zirconia, which includes small particles of molybdenum and silicon. It is these small particles that enable the coating to self-repair. Upon fracture, the silicon is oxidised and fills the crack with silicon oxide. Subsequently, the silicon oxide reacts with the ceramic coating layer and creates a stable 'fill' of the crack. The current generation of TBCs do not possess any self-repair qualities, which means that the new self-healing TBCs being developed by the SAMBA project represent a potential revolution in the treatment of turbo engines. What is more, the TBCs can potentially be applied to any field where it is necessary to improve thermal management and enhance engine fuel efficiency.